Taylor Brown's stunning debut sweeps readers back to the final, harsh year of the Civil War. 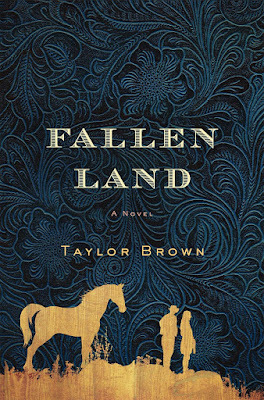 Fallen Land, Taylor Brown's debut novel, takes readers back to the final year of the Civil War--a year of cruelty and violence set against the hard, barren landscape of the soon-to-be defeated South. In this harsh new reality, Callum, a 15-year-old orphan, has teamed up with a band of brigands to roam the countryside in search of food and riches. "They had long ago forsaken the war of newspapers for the one they carried everywhere with them, and which had no colors, no sides, and which could be fit neatly into any opportunity that presented itself: ambush, pillage, torture." Against his better nature, Callum forces himself to accept the violence of his new crew--his survival depends on it, and he relishes feeling a part of a group. He continues with the band until he meets Ava, a young girl left alone on her family's farm, whose honor he intends to defend at any cost against the cruelty of the men. As Callum and Ava flee their bleak and lonely pasts together, an unexpected romance blossoms between the two. Brown writes with a strong, clear voice, conveying the difficulties of the broken countryside of the South in the wake of Sherman's "total war." Fallen Land moves seamlessly between the broad history of the Civil War and the very personal, individual struggles of Callum and Ava, resulting in a historical novel that is astounding in its depth, rooted deeply in its time while proving timeless.